The photo proving the friendship of actor Choi Woo Shik and sparrow was made public. On April 2nd, 2012, Choi Woo Shik tweeted through his Twitter account, “Like a friend with brother Woo Yong Sul,” and upload a photo. In the published photo, Jung Suk Won was reading the script with a sincere expression. 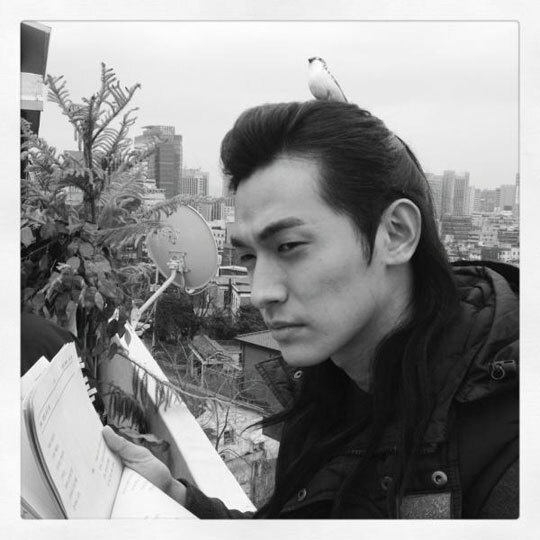 When look carefully, there was a sparrow sitting on the head of Jung Suk Won, provoking laughter. Jung Suk Won who did not seem to discover about it was eye-catching. One can feel the enjoyable atmosphere on the filming scene through the funny photo of Choi Woo Shik who plays the role of Do Chi San and Jung Suk Won who plays the role of Woo Yong Sul, who are among the confidant trio of crown prince (Park Yuchun), in SBS Korean drama Rooftop Prince. Netizens laughed and said after watching the sparrow on the head of Jung Suk Won, “Too funny,” “Since expression, so even more hilarious,” “Rooftop Prince is great,” “The charm of Do Chi San and Woo Yong Sul is great,” and so on. On the other hand, Rooftop Prince is broadcast every Wednesday and Thursday evening at 9 o’clock.